"I have activated Windows 7 on my PC, But lost the CD and serial key. I need to reinstall Windows 7, I (hope) can borrow a Windows 7 DVD somehow, but how do I find or recover my original serial key?" Need to find your Windows 7 serial key? You may realize that you've lost the serial key that came with your copy of Windows 7 system when you prepare to reinstall OS after a system crash or a virus infection on your computer. The serial key can be a sticker on the computer itself or on the box or CD case that came with the installation disc. If you've misplaced your serial key, you can still retrieve it from your Windows 7 installation. 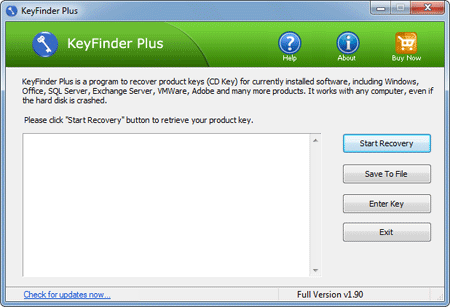 KeyFinder Plus is the software which can help you find Windows 7 serial key on a computer with Windows 7 installed. It's especially useful if you lost Windows 7 serial key and need to reinstall operating system. How to Find Windows 7 Serial Key? Here we are going to demonstrate how to find Windows 7 serial key from your current Windows 7 system, so we choose the From current system option. This program will automatically scan your local PC for product keys. Quickly find your Windows 7 serial key and recover product keys for many software products installed on your computer. The last step is to backup your Windows 7 serial key in a safe place so that you can find it easily when required.